The gene TP53 works by placing a damper on cell division and prevents cells from growing and multiplying out of control. When the gene is mutated, it may lose its normal function, allowing cell growth to run rampant. A recent study by researchers at Dana-Farber and other institutions reveals that hotspot mutations aren’t so special, after all—that mutations in TP53 are focused on certain hot spots because those spots are targeted by the specific carcinogens to which cells are exposed. The most commonly mutated gene in cancer has tantalized scientists for decades with the message of its mutations. Although mutations can occur at more than 1,100 sites within the TP53 gene, they arise with greatest frequency at a handful of points dubbed “hot spots.” Does this imbalance suggest that hotspot mutations are especially conducive to cancer or that they’re particularly disabling to TP53? What does the plethora of mutations at hot spots tell scientists about the role of TP53 within cells and about the ability of certain mutations to disrupt that role? A recent study by researchers at Dana-Farber, the Broad Institute of MIT and Harvard, and other institutions reveals that hotspot mutations aren’t so special, after all. They are no more cancer-promoting than many other mutations, and are simply artifacts of the processes by which cells acquire mutations. The discovery, which involved making every possible mutation in TP53 and testing all of them in cells, led to the creation of an online tool that physicians and researchers can use to learn the effect of any TP53 mutation they encounter. William Hahn, MD, PhD (left). TP53 is a tumor-suppressor gene that works by placing a damper on cell division and prevents cells from growing and multiplying out of control. When mutated—when the DNA code within the gene is misspelled—the gene may lose its normal function, allowing cell growth to run rampant. Mutations in TP53 are found in virtually every type of cancer, at rates of up to 50 percent in ovarian, esophageal, colorectal, head and neck, laryngeal, and lung cancer. While mutations can theoretically arise anywhere along the chain of DNA that comprises TP53—and while hundreds of such mutations have been found in tumor samples—mutations are more likely to occur in five or six hot spots than anywhere else. Researchers have speculated that cancer cells favor hot spot mutations because such mutations are particularly disabling to TP53, weakening its grip on cell growth more than other mutations do. Some have theorized that because the hot spot mutations are of a type normally found in oncogenes—which spur cancer growth—TP53 may have a hitherto-undetected oncogenic role. Learn more about research that’s happening at Dana-Farber. 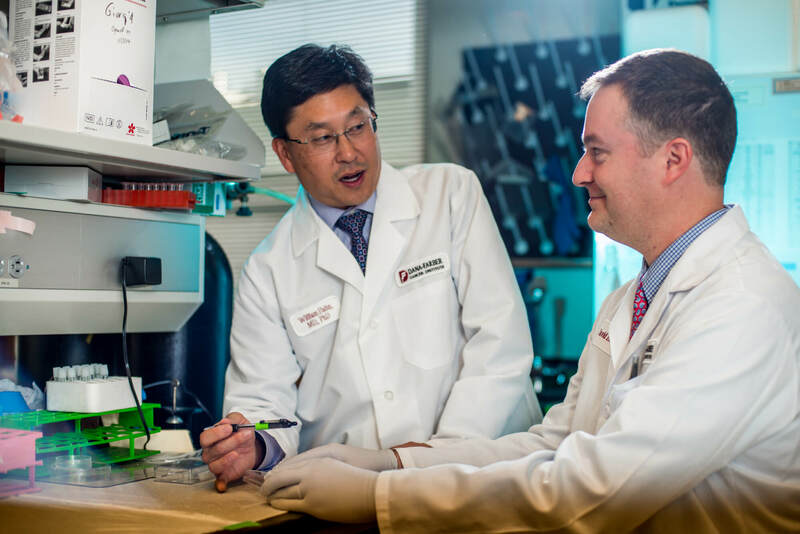 “We found that hotspot mutations were no more oncogenic—no more likely to promote cancer—than many other mutations,” Hahn remarks. “The tendency of mutations to arise in the hot spots is, rather, tied to processes by which mutations occur. Different tissues in the body tend to be exposed to different carcinogens—lung cells to carcinogens in tobacco smoke, for example, or colon cells to carcinogens in food. Researchers used the data they’d collected to predict how frequently TP53 mutations would arise in different varieties of cancer. When they matched their predictions against online data about the prevalence of TP53 mutations in various cancer types, their predictions were borne out. The first author of the study is Andrew O. Giacomelli of Dana-Farber and the Broad Institute. Co-authors affiliated with Dana-Farber and the Broad Institute include Thomas P. Howard, David Y. Takeda, MD, PhD, Seav Huong Ly, Hugh S. Gannon, PhD, Francisca Vazquez, PhD, Andrew J. Aguirre, MD, PhD, and Matthew Meyerson, MD, PhD; and Charles W. M. Roberts, MD, PhD, of Dana-Farber and St. Jude Children’s Research Hospital. Can you explain what is “hot spots”? My spine tumor (from lung cancer) tested positive for TP53. Are there treatments/clinical trials that target this? I have been on TKIs for 2 years (EGFR positive), but recently scans show some progression. Oncologists are recommending carboplatin/alimta. Thank you for reaching out. There are not any drugs that target p53 specifically. There are treatments in clinical trials (e.g., WEE1 inhibitors) that are aimed at patients with p53 mutations. Unfortunately, we are unable to offer medical advice through this blog. We would recommend talking to your care team about any questions you may have about your treatment.